Dragon Brush is a beautifully illustrated app brought to you by the same developers of Don't Let This Pigeon Run This App! Based on a traditional Chinese folktale, Dragon Brush follows the story of Bing-Wen, a poor boy who loves to draw but can't afford paint and paper. One day he receives a magical paintbrush as a thank you for helping an old woman whose cart had overturned. As he quickly finds out, his magic paintbrush drawings come to life and an adventure ensues. 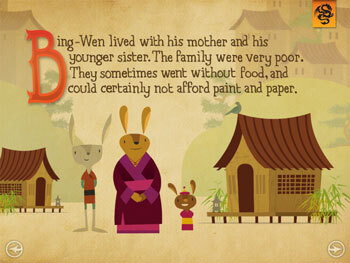 Hidden interactive elements on each page bring the story to life in a fun way, you can help Bing-Wen bring his paintings to life, and at the end of Dragon Brush you can paint your own picture that you can share with friends via email. The app is a great way for kids to read the story on their own or have it narrated for them, and engage each story page along the way. Dragon Brush is available now in iTunes for $2.99.